Gain Instagram followers, grow your personal brand, and influence others with your authentic personality, beautiful photography, and stunningly curated grid. Instagram is the place where trends break, tastes are made, and brands are launched. Plus it's packed with insightful analytics and handy business tools to help you elevate your social media presence to the next level. Create, connect with others, and share the way you see the world! Whether your passion is fitness, fashion, food, or anything in between, you can turn that passion into a business, inspire others, and meet amazing people. Learn from Tezza (@tezza) and her friends how to tell compelling visual stories on the fastest-growing social media platform, with topics including photography tips, brand engagement strategies, and advice for finding management. 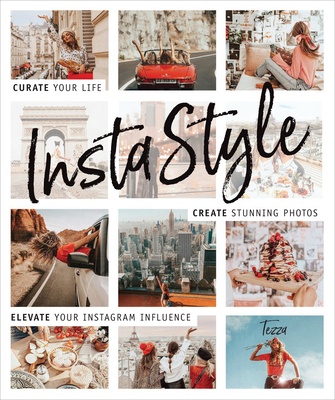 InstaStyle is a must-have guide for a booming industry, full of beautiful imagery and easily understood guides to help you achieve your Instagram goals. Fans of Tezza will love seeing her photographs in beautiful book format while gaining a behind-the-scenes look at how she curates her brand. You'll learn how you can create an immediately recognizable grid aesthetic and showcase your life while remaining true to your personal brand. Tezza (a.k.a. Tessa Barton - @tezza) is an artist, musician, and successful Instagram influencer. Through her beautiful, unmistakable photo aesthetic, she loves to inspire others to be creative and to live the art of life. She shares all her favorite things from fashion to food to travel, capturing an engaged audience with her witty captions and authentic personality. She is originally from Salt Lake City and attended the University of Utah where she received a bachelor of fine arts with an emphasis in photography. In high school, Tezza attended Parsons School of Design where she developed a love for fashion that has carried over into everything she does. She now lives in New York City with her husband, Cole Herrmann. Her personal brand encompasses her Instagram account, her blog (bytezza.com), and her product line (Tezza), which specializes in fashion, photography, and lifestyle products.